And here’s how cybercriminals operate to spread malware. 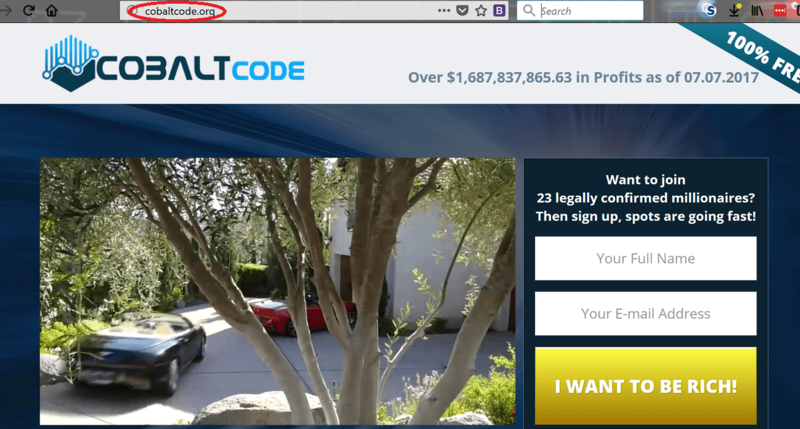 Security researchers recently analyzed several spam campaigns containing a form of Cobalt malware and discovered that the attackers have been using payloads to execute malicious actions. Online criminals are taking advantage of a vulnerability found in Microsoft Office to spread malware by using a part of the penetration test tool called Cobalt Strike. One of these spear phishing campaigns has been delivered with the following content (sanitized for your own protection). The malicious actors are baiting victims with a malicious RTF document by using a Powershell payload to abuse the CVE-2017-11882 vulnerability. This security flaw has been an issue in the Office products for over 17 years, said a report from Security Week. Fortunately, it was patched by Microsoft last November during the company’s monthly security updates. https: // help desk oracle [.] com / Winn. The malicious code is then dropped on the victim’s system as [% APPDATA%] folder: [% random filename%]. Ps1 and performed to load both 32 and 64-bit versions of “Cobalt Strike Beacons” (as these files are named) which are loaded directly into memory. From this time, the malware authors can control a victim’s system and execute a large array of commands using the PowerShell command-line tool. This video shows how the Cobalt Strike Beacon is actually used. 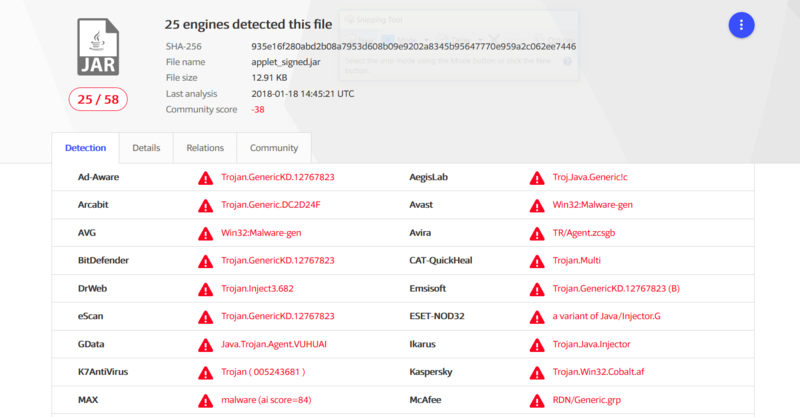 According to VirusTotal, 25 antivirus engines out of 58 have detected this .jar archive as malicious. 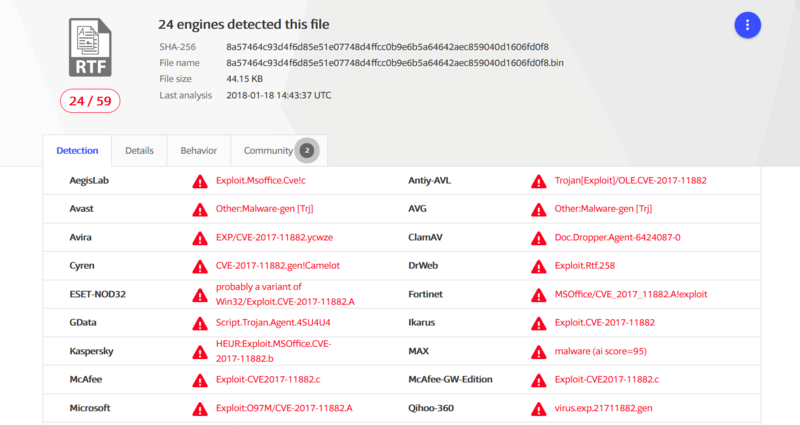 As for the malicious RTF document, which triggers the infection via the targeted email campaign, it was detected by 24 antivirus products from 59 in VirusTotal at the time we published this alert. This type of malware usually evades detection in the first place, so it’s vital to take all the security measures needed to keep your data safe. Malicious actors will always look for (software) vulnerabilities, whether are old or new, to exploit and use them in various spam campaigns like the ones shown above. Once again, it reminds us of the importance of software patching and why it is VITAL for everyone to keep their systems updated.